Starwood has just launched a new promotion for their Le Meridien brand in North America. You can earn 1000 bonus points on your first stay and 2000 bonus points per stay on subsequent stays between now and February 28, 2013. You need to register for this promotion by January 14, 2013. This is a great promotion for 2000 extra Starpoints after your first stay for which you earn 1000 bonus points. Unfortunately, the Le Meridien only has 11 participating properties for this promotion in the entire North America and French Polynesia. Not sure why the new Le Meridien in Mexico City has decided not to participate? Any member may register at spg.com/limitlessearnings.. A non-member may join the complimentary SPG program and register simultaneously, also at spg.com/limitlessearnings. Will eligible stays or nights prior to registration count towards my earning? Yes, as long as the member registers by January 15, 2013, any eligible paid stays or nights from December 3, 2012, through February 28, 2013, will count toward earning. How can I earn 1,000 or 2,000 Starpoints? A registered member will earn 1,000 bonus Starpoints on their first eligible stay and 2,000 bonus Starpoints on eligible stays thereafter at Le Méridien hotels and resorts in North America and French Polynesia that are participating in the promotion during the promotion period. At which Starwood hotels and resorts am I eligible to earn my reward? A member may earn 1,000 bonus Starpoints on their first eligible stay and 2,000 Starpoints on eligible stays thereafter at participating Le Méridien hotels and resorts in North America and French Polynesia. To view the complete list of hotels and resorts participating in the stay offer, visit spg.com/limitlessearnings. An eligible paid stay is any stay at a participating Le Méridien hotel or resort in North America and French Polynesia paying a qualifying rate that earns Starpoints as defined by the SPG Terms & Conditions (spg.com/t&c). Stays booked through pre-paid third-party channels, such as orbitz.com, expedia.com, travelocity.com, etc., are not eligible rate plans, and so the member may not earn Starpoints and will not qualify for any bonus offer. Is there a limit to the number of Starpoints I can earn? No, bonus Starpoints earnings for the Unlock Limitless Earnings with Le Meridian Hotels and Resorts in and French Polynesia promotion are unlimited during the promotion period. If I check in before December 3, 2012, or check out after February 28, 2013, does my stay earn the bonus? Yes, as long as one night of the stay is within the promotion period, 1,000 bonus Starpoints on your first eligible stay and 2,000 bonus Starpoints on eligible stays thereafter will be earned (even if part of the stay falls outside the promotion period). Bonus Starpoints will post to the registered members account within 2–4 weeks of each eligible paid-stay posting. Yes, however, each promotion earns bonuses independently of each other. Registration: Members must register online at spg.com/limitlessearnings by January 15, 2013 midnight ET. 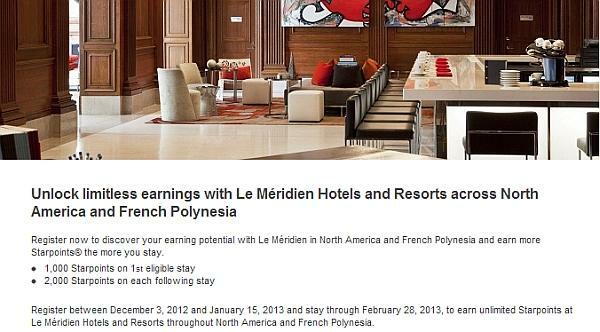 Registered members can earn bonus Starpoints® with every eligible stay between December 3, 2012, and February 28, 2013 (the “promotion period”), at participating Le Méridien Hotels and Resorts in North America and French Polynesia. A list of participating properties can be found at spg.com/limitlessearnings and is subject to change. Please Note: Members will know they have successfully registered for the Unlock Limitless Earnings with Le Meridian Hotels and Resorts in North America and French Polynesia promotion upon reaching the registration confirmation webpage. Registered members will not receive a registration confirmation email. Earning: Registered members will earn 1,000 bonus Starpoints on first eligible stay at participating properties during the promotion period. Registered members will earn 2,000 bonus Starpoints on their eligible stays after their first eligible stay at participating properties during the promotion period. There is no limit to the number of bonus Starpoints that can be earned during the promotion period. Bookings made prior to the promotion period are eligible, but only eligible stays consumed during the promotion period will receive bonuses. Bonusing: Bonus Starpoints will post to the registered member’s account within 2-4 weeks after the qualifying stay posts. Eligible stays: An eligible stay is defined as one or more consecutive nights within the promotion period at any of the participating properties paying an eligible rate in the same hotel regardless of the number of check-ins or checkouts that occur and post to the member’s Starwood Preferred Guest® account. Multiple rooms charged to the same member during the same stay will only count as one stay. Eligible stays with at least one night in the earning period will receive a bonus. An eligible rate is any rate that is eligible to earn Starpoints in the Starwood Preferred Guest program. A listing of participating hotels and resorts can be found at spg.com/limitlessearnings and a description of eligible rates can be found at spg.com under program terms and conditions. See section 1.4 for the complete definition of eligible rates, but note that certain prepaid rooms where the booking is made through a third party (including but not limited to travelocity.com, expedia.com and orbitz.com) are not eligible rates and do not earn Starpoints or qualify toward promotional earnings. Qualifications and Starwood terms: All promotions are subject to the Starwood Preferred Guest program terms and conditions, which are subject to change without notice and can be found at spg.com. Offer is applicable to individual members only and not to groups. Not responsible for omissions or typographical errors. Starwood reserves the right to discontinue this offer at any time. To update your communication preferences or learn about our privacy practices, view our privacy statement on spg.com/privacy, or access our privacy information line by calling 1-877-782-0071 in the U.S. and Canada or +353-21-4930474 in all other countries. Starpoints, SPG, Preferred Guest, Sheraton, Four Points, W, Aloft, The Luxury Collection, Le Méridien, Element, Sheraton, St. Regis and their respective logos are the trademarks of Starwood Hotels & Resorts Worldwide, Inc., or its affiliates. Void where prohibited by law.